This product is equipped with ramping up your own intensity. It has the effective manual incline with 2 different positions. They help you enjoy your workout well while taking a rest comfortably. Then training will be more interesting and require less effort than usual, while the quality also result is still good. Moreover, you can reduce the impact with the incline from 1.5% to 6% easily to set the most convenient position for your walking during long time training. Besides, the crosswalk resistance supports your upper body training so much. You are allowed to strengthen your arms with some lessons with grips. So your calories will be burned more and more. In addition, the treadmill uses the Easy Pulse ™ to control your heart rate accurately. To activate this system, you just need to push your thumb into the sensor on the console directly. Then your heart rate will be recorded easily and quickly. Some customers say that they prefer using this sensor to activate the system than the grip sensors because it is much easier to use. And also save more time and effort to start it. The LCD screen is designed wide and provide as much information related to the training process. You can control your weight loss and performance by following the ratio appeared on the screen. Moreover, it offers some basic functions through simple buttons on that such as start, stop function, up/down speed, select your own workout programs, etc. That allows you monitor your training easier and more effective. The speed control is designed digital and 10 miles per hour system. So speeding up or down is not a trouble for any subject of customers, from beginners to expertise ones. And 4 pre-set programs are set to give you more options in workout process. This treadmill also has the foldable structure which allows you to fold and store it easily. It is very light and compact as well. So it will be one of the best choices for older people to train. And the warranty for the parts and labor is just only 90 days. + Adjustable incline: it has 2 positions for you to control. + Compact structure: it can be folded to save more space in your corner. And it has lightweight which is super suitable for older people. 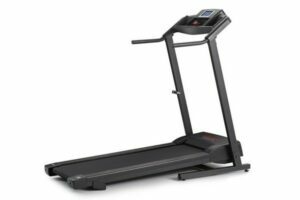 + Narrow running area: due to its compaction, this treadmill does not allow us to take much area in running as well. This may be the big problem for someone who taller or especially runners. This Weslo Crosswalk 5.2T Treadmill is not very bad idea if you are looking for a good treadmill for your workout. It allows you to strengthen both upper and lower part of the body. However, the narrow space for running is just 16’’ wide and 47’’ long, a little bit narrow for runners or people who want to train intensively. This product is equipped with a large LCD screen. It helps you follow your stats during walking easier such as time, speed, step, calories burned or the programs you chose. Then you will be able to control them well to promote your workout effectively. The console allows you to choose your workout program which is the most suitable for you, the quick speed is necessary, start or stop buttons and the display as well. So you can control your workout well, adjust functions to fit into your demand in the best way. Especially, the quick speed control has the MPH range from 0 to 8. The treadmill provides you 8 different workouts to follow much more effective. And the cell cushioning is promised to give you the most comfortable workout you have. All of them created the functional system for this machine. It definitely attracts more attention of customers. Moreover, the drive system with 1.0 HP and 166’’ x 47’’ in tread belt provide you a quite convenient walking. The structure of this machine is narrow enough for you to train effectively and still store it easier. However, this feature does not comfort taller or bigger people very much. They will feel a little bit narrow or ugly with this actually. In addition, it has a capacity of 225 lbs, 1-year warranty for the motor, 90 days warranty for parts and labor. That seems to be acceptable for a good treadmill for everyone. + LCD window: large, easy to oversee, how many current stats while you are training. You can take it accurately than have the right direction in promoting your workout as well. + Console: allows you to control the speed, programs, etc fit into your workout demand. + Quick speed control: this system allows you to control the speed from level 0 to 8 to serve your program also target well. + 8 pre-sets: provide more options for training for users. This will be the big advantage for customers. With these programs, people from beginners to expertise one both can improve their situation well by following the suitable programs. 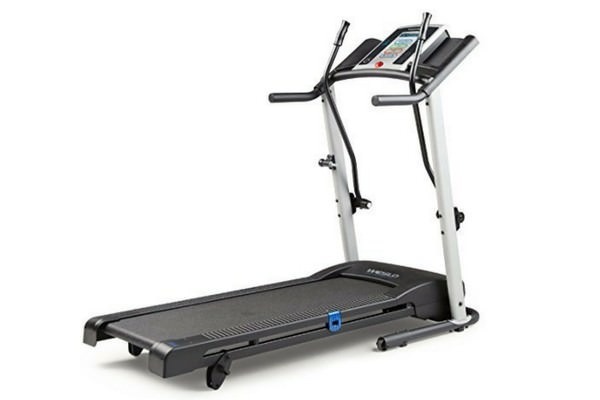 + Compact: this treadmill is quite light and easy to store after use. It is not only light, easy assembly but also has the small appearance. So you can find it simple to put it in a small corner in your room without losing the architecture. + Narrow running area: it is quite narrow so that some people who taller or bigger or especially runners will get some troubles in fitting into it. This Weslo Cadence G 3.9 Folding Electric Treadmill with Easy Assembly provides you many advantages in workout process. It allows you to exercise and control the current workout stats accurately. So you will have the efficient schedule of training to improve your body health. In total, this is a good choice for you to promote to get the perfect body.